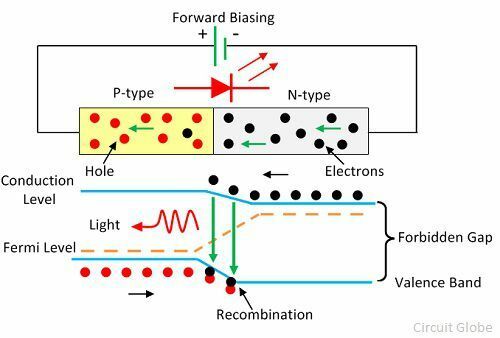 Definition: The LED is a PN-junction diode which emits light when an electric current passes through it in the forward direction. In the LED, the recombination of charge carrier takes place. The electron from the N-side and the hole from the P-side are combined and gives the energy in the form of heat and light. The LED is made of semiconductor material which is colourless, and the light is radiated through the junction of the diode. The LEDs are extensively used in segmental and dot matrix displays of numeric and alphanumeric character. The several LEDs are used for making the single line segment while for making the decimal point single LED is used. The recombination of the charge carrier occurs in the P-type material, and hence P-material is the surface of the LED. For the maximum emission of light, the anode is deposited at the edge of the P-type material. 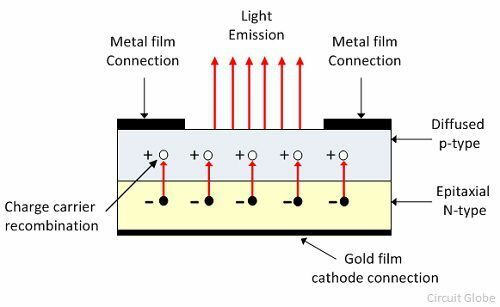 The cathode is made of gold film, and it is usually placed at the bottom of the N-region. This gold layer of cathode helps in reflecting the light to the surface. The gallium arsenide phosphide is used for the manufacturing of LED which emits red or yellow light for emission. The LED are also available in green, yellow amber and red in colour. The simple transistor can be used for off/on of a LED as shown in the figure above. The base current IB conducts the transistor, and the transistor conducts heavily. 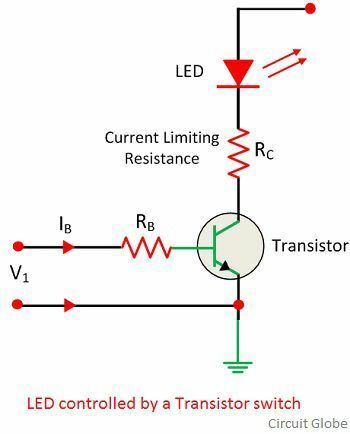 The resistance RC limits the current of the LED. The working of the LED depends on the quantum theory. The quantum theory states that when the energy of electrons decreases from the higher level to lower level, it emits energy in the form of photons. The energy of the photons is equal to the gap between the higher and lower level. The LED is connected in the forward biased, which allows the current to flows in the forward direction. The flow of current is because of the movement of electrons in the opposite direction. The recombination shows that the electrons move from the conduction band to valence band and they emits electromagnetic energy in the form of photons. The energy of photons is equal to the gap between the valence and the conduction band. The followings are the major advantages of the LED in an electronics displays. The LED are smaller in sizes, and they can be stacked together to form numeric and alphanumeric display in the high-density matrix. The intensity of the light output of the LED depends on the current flows through it. The intensity of their light can be controlled smoothly. The LED are available which emits light in the different colours like red, yellow, green and amber. The on and off time or switching time of the LED is less than of 1 nanoseconds. Because of this, the LED are used for the dynamic operation. The LEDs are very economical and giving the high degree of reliability because they are manufactured with the same technology as that of the transistor. The LED are operated over a wide range of temperature say 0° – 70°. Also, it is very durable and can withstand shock and variation. The LED have a high efficiency, but they require moderate power for operation. Typically, the voltage of 1.2V and the current of 20mA is required for full brightness. Therefore, it is used in a place where less power are available. The LED consume more power as compared to LCD, and their cost is high. Also, it is not used for making the large display.